Only 27 hours into the month of August and already the volunteers of the KPVFC have responded to 8 calls for service. Along with the usual alarm system calls, we also were alerted to an outside electrical fire, an elevator rescue, a natural gas leak and of course 2 more dreaded mulch fires. Upon our return from a mulch fire at the local Target Store this afternoon, the crew from Engine 47-2 was directed to the intersection of Wilson & Long Roads in the Valley Forge Homes Section for a cat trapped in a storm sewer. Although it’s not uncommon for the brigade to be requested to rescue young Canadian Geese, we’ve also been summoned to the cat in the tree call, from time to time. 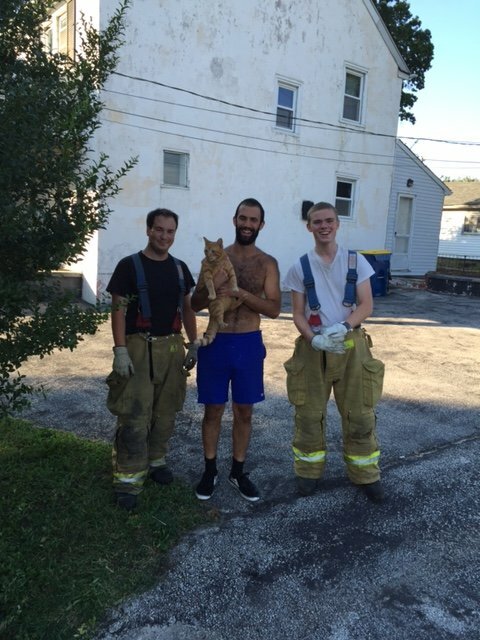 However, a cat in the storm drain was definitely a first for the engine company crew. After making quick work of removing the storm drain cover and accessing the situation, the crew was able to persuade the frightened feline to allow us to bring him to safety. Pumpkin was immediately reunited with his owner and of course allowed time to take a snap shot with the rescue crew. Just when you thought that you you’ve seen it all, you catch a run like this.